Guess which Korea is free and which is a communist dictatorship? 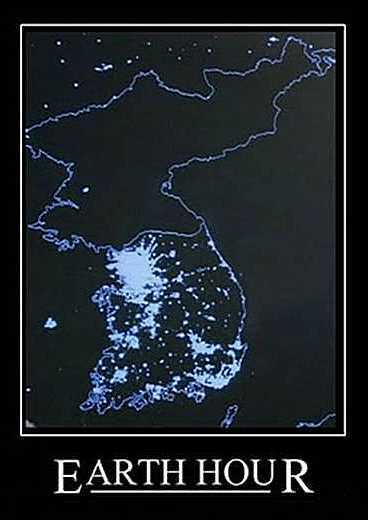 Guess which Korea eats and which one starves? Electricity sets us free. Choose freedom. Build more power plants. Viv Hughes, chairman of the Australia-based Carbon Sense Coalition, frequently talks sense about the carbon dioxide “demon”. Today he takes aim at the guilt-easing, yet nonsensical, notion of “Earth Hour”, an increasingly popular expression of opposition to so-called “climate change”. His focus is of course Australia, but that’s not so far from us, is it? Note that we get 70% of our electricity from hydro power, not oil, and, for Penny Wong and rationing, read John Key and the ETS, which will have largely the same effect. I want to say more about the folly of Earth Hour, but first read Viv’s no-nonsense dose of cold reason for these hot, fanciful fears of man-made disaster. Earth Hour or Blackout Night? A statement by Viv Hughes, Chairman of the Carbon Sense Coalition. Visit the Carbon Sense web site to download a pdf of this statement – spread it around. Earth Hour should be renamed “Blackout Night” and be held outdoors, for the whole night, in mid-winter, on the shortest and coldest day of the year – 22 June in the Southern Hemisphere. which are never actually visible. When will we fight it? John Boscawen, Act List MP, today issued this press release. New Zealanders can definitely expect to have to pay more for power from July 1, with Genesis Energy CEO Albert Brantley’s confirmation before the Finance Select Committee today that his company “will recover the cost” of complying with the Government’s Emissions Trading Scheme, ACT New Zealand ETS spokesman John Boscawen said today. “And it is not only the cost of electricity that will increase, but that of petrol and industrial processes as well. The cost of basic food items – such as bread and milk – will also rise as the increase in electricity filters through the economy,” Mr Boscawen said. “Kiwi families are facing massive price increases and a lower standard of living for no other reason than the Government’s desire to be seen as a world leader heading into the Copenhagen summit. “But the summit was a failure, and now New Zealand is the only county to implement an all sectors, all gases tax. Not one of our three major trading partners – Australia, the US or China – has implemented an ETS, nor are they likely to. It is time the Government acknowledges that it is out of step with the international community, and puts the ETS on hold. The pressure on low-income families, the cost in reduced incomes and lost job opportunities is entirely avoidable. It’s not too late to stop,” Mr Boscawen said. No doubt the government is pleased finally to have found a pretext for taxing the very air we breathe. This makes taxation very simple and in future they can avoid straining their creativity trying to arrange for ever greater interference in our lives and increasing their regulation of innocent pleasures. This interference, restricting the innocent pleasure of breathing out, is superlative, for it comes closer to the tyrant’s dream of relentless restraint of the population than any measure before it. NIWA have the adjustments — so what are they? 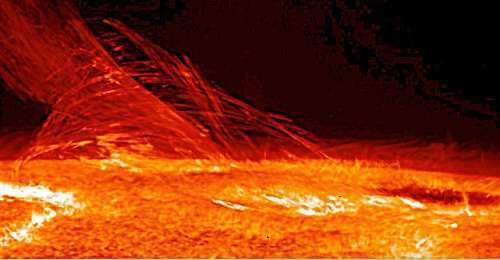 The surface of the Sun, which is hotter than you can imagine. It is hotter even than a sausage being fried to the edge of its existence in a hot frying pan, so it is very hot indeed. A picture of the sun’s surface is often used like this to illustrate a story involving heat, but when the amount of heat involved in the story is vastly different from the amount pictured, it’s a deceptive trick. This is a trick. Niwa principal climate scientist Dr Brett Mullan said Niwa “had the original data, knew the method of the calculations, and we have the answers”. There was “no scientific issue from our perspective”, and Dr Salinger’s work had stood the test of time. The NZ Climate Science Coalition began asking NIWA for the adjustments to the national temperature record in late November. NIWA have told us where we could find the adjustments; we searched for them where they told us to search; the adjustments are not there. On Friday, 27 November 2009, the National Institute of Water and Atmospheric Research (NIWA) published a short press release at Scoop. Under the heading “Combining Temperature Data from Multiple Sites in Wellington”, NIWA described in some detail the process of adjusting temperature readings when the weather station has been moved. By way of example, they cited Wellington, where, they said, the Thorndon weather recording station was moved in 1928 to Kelburn. The Kelburn site is colder because it is about 120m higher than the Thorndon site. The process of combining data from various Wellington sites is illustrated below. Such site differences are significant and must be accounted for when analysing long-term changes in temperature. The Climate Science Coalition has not done this. NIWA climate scientists have previously explained to members of the Coalition why such corrections must be made. NIWA’s Chief Climate Scientist, Dr David Wratt, says he’s very disappointed that the Coalition continue to ignore such advice and therefore to present misleading analyses. But now, in a dramatic turnaround, they confess, in a written answer to a Parliamentary question, that this “example” of adjustments for the reason of altitude change was fiction. They have not changed any temperatures for that reason at any station in the national “seven-station” series. They were lying to us. They openly mocked Rodney Hide for not knowing about that sort of thing and scolded the inquiring scientists at the NZ Climate Science Coalition and falsely incited their supporters, such as the rabid warmers at Hot Topic, into making vicious attacks on the credibility of the NZ CSC and the Climate Conversation Group. Station adjustments are not made on the basis of elevation differences, either for Wellington or for any of the other six locations. Adjustments are calculated from comparisons of different stations’ records, as described in the NIWA document Creating a Composite Temperature Record for Hokitika. Wellington is a special case where two sites, Thorndon and Kelburn, are very close to one another horizontally but with a large (approximately 120m) altitude separation. This does not occur for any of the other six locations in the “seven-station” series. Temperature differences between Wellington sites correlate well with measurements, in many parts of the world, of temperature decrease with altitude. This “lapse-rate” effect has been used to confirm that the adjustment between Thorndon and Kelburn, calculated by inter-station comparison, would be expected from the altitude difference between the sites. The slippery scientists at NIWA now admit that they didn’t use the altitude “lapse rate” method to calculate adjustments. They say it only “confirmed” adjustments made by another method. So why did they ridicule us? If NIWA have any credibility left it would be surprising. How will Gareth Renowden respond to this? Is he getting the picture yet? 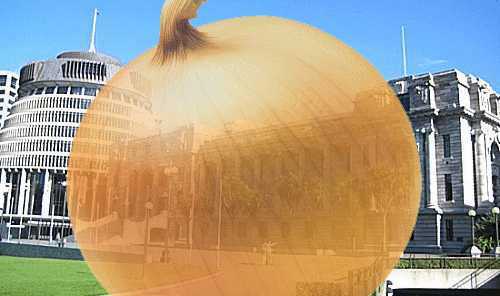 Peeling the onion in the Parliament. Like the onion, everything associated with Parliament has layers. As we make our way through the Parliamentary questions we discover more and more. We’re working through several answers from the Hon Wayne Mapp, Minister of Research, Science and Technology, concerning questions posed by ACT about the National Institute of Water and Atmospheric Research (NIWA). The last of the questions posed by John Boscawen on behalf of ACT on February 19 asked about the official graph of the seven-station temperature series which shows warming over New Zealand during the 20th Century. The answer, on March 1, said the iconic graph was finally justified by work done over about six weeks, from mid-December to early February. I’m sorry, that’s wrong: the graph was not justified by this work; the graph remains unjustified except for the portion related to Hokitika — that’s right, yes, I’ve got it now. The work NIWA did justified only the temperature history at Hokitika, although it hasn’t been peer-reviewed yet by independent scientists, only by colleagues at NIWA, so there might still be errors in it. Humans to blame for climate change. Yeah, right. 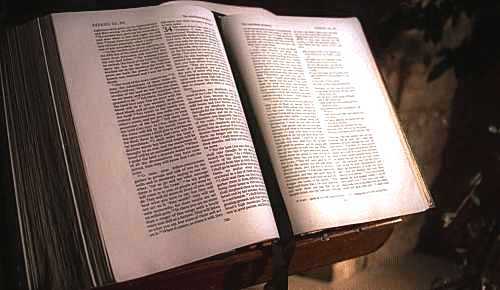 The Holy Bible, once widely considered the word of God. A new scripture has arisen in the name of “The Environment” claiming it has the right to avoid change. Though Nature has constantly changed the environment and always will, the new scripture hectors us to spend a lot of time and money to ensure that it doesn’t change. If a change is observed, the religion states that it’s a problem, it’s our fault and we must act in super-human ways to change it back again as soon as possible. Apparently it is our duty to do this because we are fundamentally wicked and selfish and we don’t deserve to be here on this nice planet. From the Independent, written by Steve Connor, Science Editor, and echoed uncritically by the NZ Herald yesterday, comes an amazing story of faith. It must be faith because it cannot be science — there are too many opinions and the facts are wrong. With the original Independent headline advertising the ignorance the story is steeped in (Humans must be to blame for climate change, say scientists) the articles of faith are reiterated for the global warming multitudes. Harken ye unto them, that ye stray not from the green and carbon-free path of righteousness, I say unto thee, even your sons and your grandsons, keep to these my commandments, yea, even unto the hundredth year from this day, when, verily, these green prophecies shall surely come to pass, but, the Lord says, not before then. Climate scientists have delivered a powerful riposte to their sceptical critics with a study that strengthens the case for saying global warming is largely the result of man-made emissions of greenhouse gases. If only raw temperature data is supplied by NIWA to NASA, NOAA and the Hadley Centre, what additional information is supplied so that NASA, NOAA and the Hadley Centre are able to make their own judgements about temperature adjustments? Along with the raw data NIWA provides latitude, longitude, altitude of the site, period of record, along with information on site exposure and instrument history. Why don’t the overseas agencies trust NIWA to make accurate adjustments? Have they found reasons to doubt they were made properly? For that matter, why do NIWA mistrust the adjustments made by NASA, NOAA and the others? Why do they make their own? We’re working through several answers from the Hon Wayne Mapp, Minister of Research, Science and Technology, concerning questions posed by ACT about the National Institute of Water and Atmospheric Research (NIWA). This is a real good one, you just have to know what happened elsewhen to appreciate the depth of its stupidity. Actually, boys, the game is up. All the posts on NIWA’s web site criticising the Coalition, me and the study we published have just been removed. The articles defending NIWA’s performance regarding the national temperature record have also been removed from the web site. Is this the start of something fresh and open from the Board of Directors? The book Hot Topic is as mistaken in its theme as in its angst-ridden depiction of a melting New Zealand. It’s author defends NIWA, no matter what, yet NIWA’s own graph demonstrates no New Zealand warming since about 1950. Why doesn’t he believe what they’re telling us? His book is entirely superfluous. My comments at Treadgold’s blog are now deleted. Ken, whose repetitive comments here, with their artificial argumentation, became quite vexing, risks misleading Hot Topic’s readers into believing I deleted all his comments. For that is not true. Actually, only Ken’s latest comment was deleted, for being derogatory, personal and in bad taste. I deleted a comment only after repeated warnings not to indulge in ad hominem remarks, which he ignored. It’s easy to verify that all his previous comments are still sitting here, ready to illuminate us. No doubt pluralising his “comment” was indeliberate and I look forward to his apology when he hears of my rebuttal. Looking at some of the other comments, I’m surprised to see that scarcely a sentence mentions the national temperature record, which is what I’m talking about. Or perhaps not surprised, having noticed before that most contributors there (but not all) seem happy just to stand around muttering insults. I might say that some of the remarks are in the most dreadfully poor taste. It’s a wonder that Mr Renowden lets them stand. A further question asked the minister why he tabled the Hokitika analysis instead of an analysis for all seven stations, as Rodney Hide had asked and David Wratt had agreed to do during the December meeting of MPs. Nick Smith prevented a record being kept of that famous meeting, so the only account of it came from Rodney Hide in a late-night phone call. You can read it here on the CCG blog. One question concerns the production of what we have referred to as the Schedule of Adjustments (SOA). It’s simply a statement of what changes were made to the raw temperature readings, why and when, in order to record the scientific justification for them. The Climate Conversation Group (CCG) and the NZ Climate Science Coalition (CSC) have been asking NIWA since November to disclose the SOA. Privately, they have told us they are “reconstructing” the SOA, and, indeed, on February 9, they quietly posted a list of all the adjustments to the seven-station series together with a discussion of the reasons for Hokitika. Well done, them. The country’s climate forecaster is bowing to public pressure and putting all of its temperature data and calculations on the internet because of mistrust fuelled by errors overseas. Principal climate scientist James Renwick said Niwa had decided to bare all because “if we don’t we appear to be hiding something”. Two people in Niwa’s climate group have prepared a full set of documents including all the data from climate stations and a full explanation of the adjustments made to records, which should be available online in about a week. NIWA supply temperature data to the big overseas teams that maintain the global temperature datasets, including NASA, NOAA, the Hadley Centre, the WMO, NCDC and the UK Met Office (Hadley Centre). It’s a bit odd that not all those organisations get the same sets of data. For instance, the WMO gets monthly summaries comprising Kaitaia, Rotorua, Gisborne, New Plymouth, Paraparaumu, Kaikoura, Hokitika, Christchurch, Tara Hills, Invercargill, Raoul Island, Chatham Islands and Campbell Island — 13 stations in total. From time to time, “Other data are provided in response to requests to NIWA.” So in August 2005, NCDC and NOAA reveived data from Kaitaia, Gisborne, New Plymouth, Paraparaumu, Hokitika, Tara Hills, Invercargill, Campbell Island, Chatham Islands and Raoul Island. That’s a bunch of 10 stations. In August 2003, NIWA apparently sent (isn’t this fascinating?) the WMO data from 17 New Zealand sites: Kaitaia, Rotorua, Gisborne, New Plymouth, Napier, Paraparaumu, Nelson, Kaikoura, Hokitika, Christchurch, Tara Hills, Dunedin, Invercargill, Raoul Island, Chatham Island, Campbell Island and Scott Base, Antarctica. So that’s a New Zealand site? In 1994, the UK Met Office (Hadley Centre) got temperature data for the seven-station series, plus Havelock North and Mt Cook (my emphasis). Strange that in every case the overseas teams received data from more sites than we ourselves use for the national record. Why does NIWA select only seven sites to describe the whole country? They really ought to explain it to us. Suspicious warming trend proof of bias? Peeling the onion in the Parliament. The NZ Parliament Building in the capital, Wellington. The attached “Beehive” (affectionate local name bestowed for obvious reasons), provides office accommodation for MPs and staff. Questions asked in the Parliament of ministers of the Crown must be answered unless they concern “operational matters”. Like the onion, everything associated with the Parliament has many layers. As we make our way through the Parliamentary questions it’s surprising what is being uncovered. We’re working through several answers from the Hon Wayne Mapp, Minister of Research, Science and Technology, concerning questions posed by ACT about the National Institute of Water and Atmospheric Research (NIWA). Some of the answers are bombshells. One reveals that NIWA lost vital worksheets used by Dr Salinger in constructing the national temperature record. … how many of the years before 1950 had their temperature adjusted downward in the NIWA “Seven-Station” Temperature Series and how many upward; and how many of the years after 1950 had their temperature adjusted downward and how many upward? 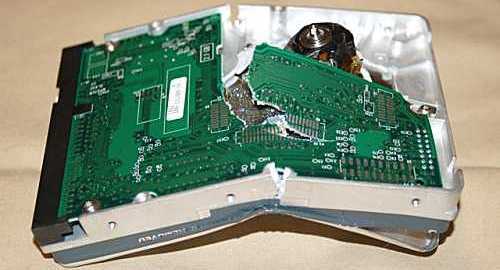 A destroyed hard disk drive. When it’s in this condition nobody can retrieve the information. Does this represent NIWA’s reputation? NIWA have admitted that vital original material used to prepare the official New Zealand temperature records was deleted. They do not say when it happened, but it means that, in contravention of time-honoured principles of good science, NIWA is no longer able to verify the work done by Dr Jim Salinger. The news came in an answer to a written parliamentary question from ACT and comes as NIWA is under pressure to justify the so-called “seven-station” time series that forms the centrepiece of their evidence of long-term warming. The official New Zealand temperature graph from NIWA. Their web site claims “a warming trend of 0.9°C over the past 100 years (1909 to 2008)”. But the period since about 1950 (highlighted) is virtually free of warming, verified by senior scientist Jim Salinger (ex-NIWA employee) as having a warming trend of 0.3°C. Click for larger version. NIWA goes to a lot of trouble to warn us about the coming “climate change” causing warming between 0.7°C and 5.1°C by 2090. But I can reveal evidence that our top climate scientists don’t believe this. Should New Zealanders expect significant warming for the next 80 years? You might be surprised to learn — especially if you’re following the discussions here — that scientists with NIWA, whose job is to research the climate, tell us we already haven’t had any warming to speak of for about 60 years and we won’t get serious warming in the future.